33 … Another day doing what they do, talking about a nice work environment. There are times Plaza de las Armas needs traffic directors, here are two. 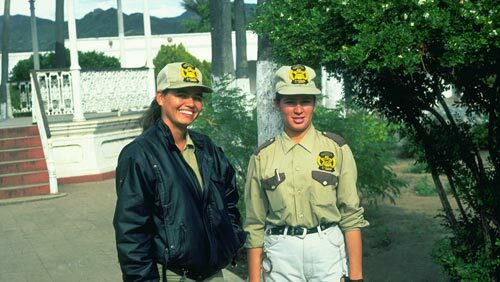 The year is 1992, Lupita Dominguez and Clara Miranda Meza are Alamos traffic police women. On weekends and holidays their beat was the Plaza and their job was keeping traffic moving and trouble away. They could also be seen at most special events around town, anything that created traffic situations. They performed other police functions as needed. These were the days when social etiquette frowned on women wearing shorts in public. By my return shoot in 1996, women were wearing shorts everywhere. Times change, fashion changes, the Plaza remains the same. 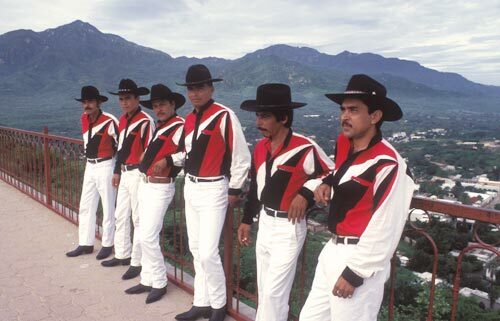 Music group Halcon de Sierra Alamos pose with their namesake behind them. m.
1996, Halcon was led by sax player Manuel Dominquez. He was the father to Luis, keyboards and sax, and Roberto who played a mean bass. Their family home was the old cine in town. One of their sisters was Lupita, the police woman. You can tell the Dominquez family by their million dollar smiles. Seen here, left to right, are Manuel, Luis, Javier Claussen Ramierz – guitar, Roberto, Pedro Tomas Hurtado Valenzuela – drums, and their vocalist Hector Gastelumn Garcia. I went to see them play at a local dance, interesting music to say the least. They played their own intricate compositions that incorporated elements from jazz, funk, rock, middle east, european, mexican pop and traditional music. Most importantly, the packed hall stayed on their feet all night long dancing, viva musica! Talented young artists demonstrate their skills in the Plaza. Alamos is a major mexican tourist destination in the summer. Buses come in from all over the region. The museum is busy with visitors. The plaza is activate with events. 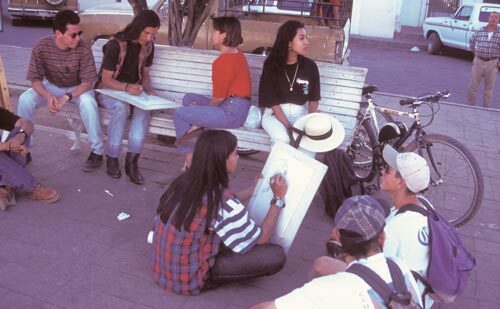 These young artists from Navajoa, 34 miles to the west, had giving an art demonstration in the museum and came outside to sketch in the plaza. 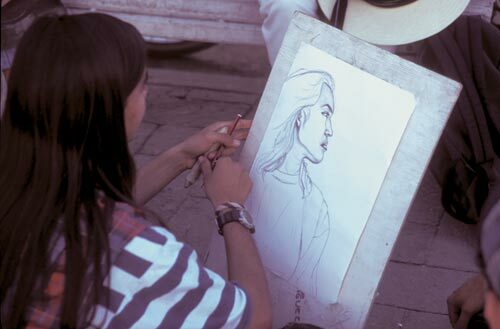 They drew not only young women of Alamos but a crowd, viva arte! The ability to see and capture a moment is a human thing, a human need. The young woman pictured here worked in the Alameda. I would often see her outside an office on the south sidewalk. I hope this Daily Journal project helps me find names for these faces. Here is a proud profile from Alamos, Sonora, Mexico, 1996. Every morning in the summer he would reset his art display in the Plaza. 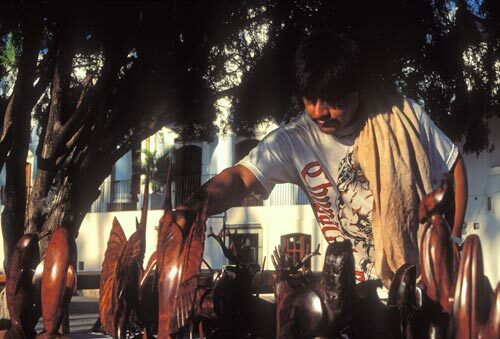 Julio Horoyoqui Ontiveros displayed his work outside Hotel Los Portales in the Plaza. 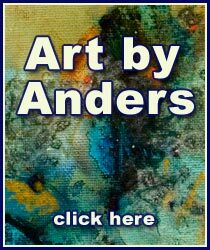 Every summer morning he was there unpacking his wooden sculptures and displaying them for sale. Others would gather around him and read morning newspapers and comment on world affairs. They knew I was a San Diego Padre fan and kept me informed on a tight 1996 pennant race between my Padres and the Los Angeles Dodgers. Baseball is big in Sonora, birthplace of legendary Fernando Valenzuela. The Padres won on the last day. What would de Anza think of these Californias today? This page took 0.405 seconds of computer labor to produce.